You are currently browsing the category archive for the ‘Inca Folklore’ category. 47 Images and 20 illustrated capitals in Black and White by John D Batten from MORE CELTIC FAIRY TALES compiled by Joseph Jacobs. Black and white illustrations are ideal for printing off and giving to children to colour in. 11 Classic Fairy Tale Illustrations by ALICEA POLSON from WONDERWINGS AND OTHER STORIES by Edith Howes – 3 in colour plus a complimentary image of the original cover. We have created a dedicated area for the digitised illustrated works of Andrew Lang. In the main these consist of the Many Coloured Fairy Books plus his other illustrated works. Of note are the Arabian Nights Entertainments – containing 32 tales from the 1001 Arabian Nights. These were selected and compiled by Andrew Lang and detail heroic figures such as Aladdin, Ali Baba, Sinbad, and others, whose luck and ingenuity carry them through perilous adventures. Like the Grimm brothers, Andrew Lang collected fairytales from around the world. Where necessary he and his wife translated and retold them in English. The publisher Longmans, Green and company, now a part of the Pearson publishing empire, teamed Lang up with illustrator H. J. Ford, and what a partnership it was. It was so good that during the late Victorian era the works by Andrew Lang outsold those created by the Grimms. So, you’re invited to download and enjoy. All eBooks only US1.99 or about £1.50, €1.70, A$2.69, NZ$2.93, INR137.01, ZAR26.99 depending on the rates of exchange. 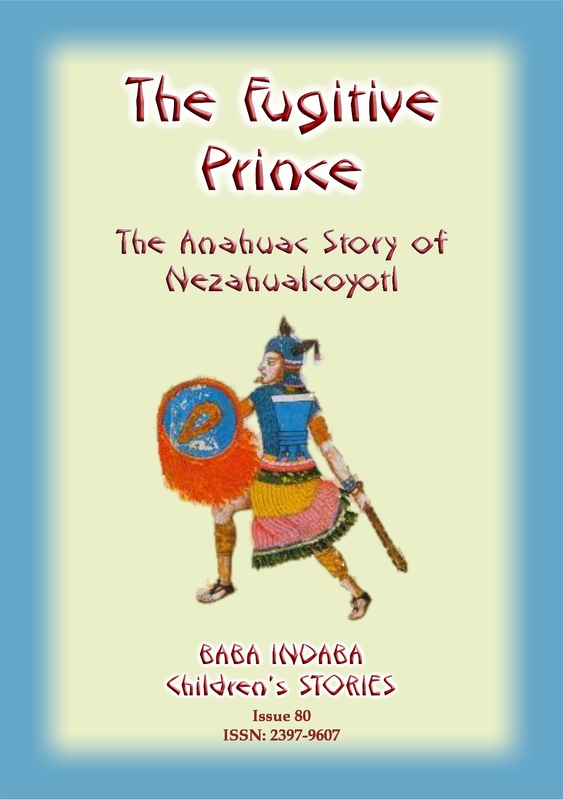 In Issue 80 of the Baba Indaba Children’s Stories, Baba Indaba narrates the ancient tale of Nezahualcoyotl, Prince Regent of Tezcuco. Long ago and far, far away in the ancient land of Anahuac, that is modern day Mexico, the Tecpanecs overcame the Acolhuans of Tezcuco and slew their king. Nezahualcoyotl (Fasting Coyote), the heir to the Tezcucan throne, saw his father laid low from the shelter of a tree close by, and succeeded in making his escape from the invaders. This is the story of his subsequent thrilling adventures, escapades, scrapes and escapes and eventual ascension to the Tezcuco throne. In Issue 80 of the Baba Indaba Children’s Stories, Baba Indaba narrates the ancient tale of Nezahualcoyotl, Prince Regent of Tezcuco. Long ago and far, far away in the ancient land of Anahuac, that is modern day Mexico, the Tecpanecs overcame the Acolhuans of Tezcuco and slew their king. Nezahualcoyotl (Fasting Coyote), the heir to the Tezcucan throne, saw his father laid low from the shelter of a tree close by, and succeeded in making his escape from the invaders. This is the story of his subsequent thrilling adventures and eventual ascension to the Tezcuco throne. In this 73rd story from Baba Indaba’s Children’s Stories, Baba Indaba narrates the story of the founding of the Toltec empire in 566AD to it’s fall four hundred years later……….…… Download and read this interesting story, rewritten and shortened for children which tells of good intentions and what happens when rulers become corrupt.